PKS 1718−649: Difference map between the hard (1.5–10 keV) and soft (0.3–1.5 keV) band including counts of Ch 1, Ch 2, and Ch 3. Positive pixels (blue) depict a hard excess, negative pixels (red) a soft excess. Overlayed contours in black show H2 1–0 S(1) emission (Maccagni et al. 2016). Credit: Beuchert et al., 2018. An international team of researchers has performed of extended X-ray emission in the radio source known as PKS 1718−649. The study, published April 11 in a paper on the arXiv pre-print repository, reveals more details about physics of the environment of this source and could be helpful in disclosing its real nature. PKS 1718−649 is one of the closest and most comprehensively studied gigahertz-peaked radio spectrum (GPS) sources. Although many studies of this source have been conducted, its real nature is still debated. Some researchers classified it as a compact symmetric object (CSO), a small and powerful extragalactic radio source exhibiting emission on both sides of an active galactic nucleus (AGN). On the other hand, some studies suggest that it is an AGN still embedded in its optical host galaxy. 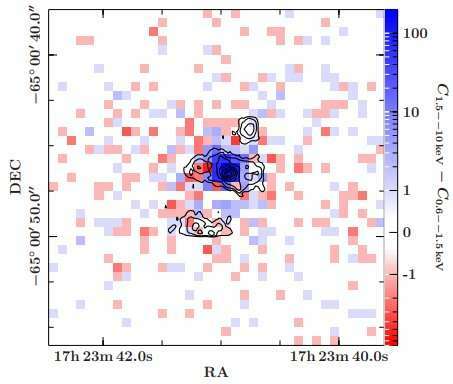 In order to investigate the nature of PKS 1718−649, a team of astronomers led by Tobias Beuchert of the University of Amsterdam in the Netherlands has performed a study of an extended X-ray emission from the environment of this source. The research is based on an analysis of observational data obtained by NASA's Chandra X-ray Observatory and ESA's X-ray Multi-Mirror Mission (XMM-Newton). "In this letter, we investigated the nature of the extended X-ray emitting gas in PKS 1718−649," the researchers wrote in the paper. According to the study, this gas primarily emits in soft X-rays and is most likely part of the extended, hot interstellar medium. In particular, the researchers found that besides a photo-ionized gas phase on subparsec scales, the bulk of the soft X-rays is emitted by diffuse, hot (with a temperature of almost 10 million K), and collisionally ionized gas that dominates the nuclear emission on kiloparsec scales. The astronomers attempt to determine the most plausible scenario to explain this extended X-ray emission in PKS 1718−649. They assume that supernovae are most likely the driving mechanism of such emission. This excludes the previously proposed explanation, suggesting that young AGNs are behind this activity. "We therefore propose an alternative scenario, where supernovae in the host galaxy can feed the galactic halo with hot and X-ray-bright gas," the paper reads. The researchers noted that this newly proposed scenario is supported by observations of active star formation in PKS 1718−649, estimates on the expected supernova rate, as well as the theoretically predicted X-ray flux of supernova remnants. "While the feedback of the central AGN still seems to be constrained to the inner few parsecs, we argue that supernovae are capable of producing the observed large-scale X-ray emission at a rate inferred from its estimated star formation rate," the scientists concluded. PKS 1718−649 is one of the closest and most comprehensively studied candidates of a young active galactic nucleus (AGN) that is still embedded in its optical host galaxy. The compact radio structure, with a maximal extent of a few parsecs, makes it a member of the group of compact symmetric objects (CSO). Its environment imposes a turnover of the radio synchrotron spectrum towards lower frequencies, also classifying PKS 1718−649 as gigahertz-peaked radio spectrum (GPS) source. Its close proximity has allowed the first detection of extended X-ray emission in a GPS/CSO source with Chandra that is for the most part unrelated to nuclear feedback. However, not much is known about the nature of this emission. By co-adding all archival Chandra data and complementing these datasets with the large effective area of XMM-Newton, we are able to study the detailed physics of the environment of PKS 1718−649. Not only can we confirm that the bulk of the ≲kiloparsec-scale environment emits in the soft X-rays, but we also identify the emitting gas to form a hot, collisionally ionized medium. While the feedback of the central AGN still seems to be constrained to the inner few parsecs, we argue that supernovae are capable of producing the observed large-scale X-ray emission at a rate inferred from its estimated star formation rate.